Strings of type StringBuilder are mutable where as strings of type System.String are immutable. As StringBuilder objects are mutable, they offer better performance than string objects of type System.String, when heavy string manipulation is involved. Let's understand the meaning of mutable and immutable strings with an example. In this example, userString variable is changed 5 times. Since, userString variable is of type System.String, and when we change this string 5 times, we end up with 5 string objects on the heap as shown in the diagram below. Immutable means, once a string object is created it cannot be changed, without creating another new string object. So in our example, When we initialize userString variable to "C#" we get one immutable string object on the heap. 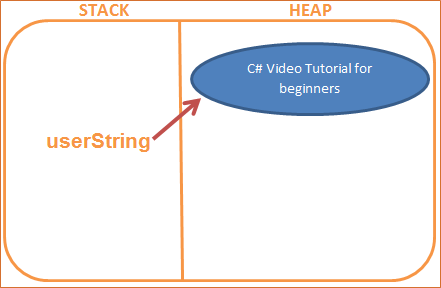 When we concatenate " Video" word to userString variable, the first created "C#" string object is orphaned(userString variable no longer points to this object). Now another new string object with words "C# Video" will be created to which the userString variable points to. 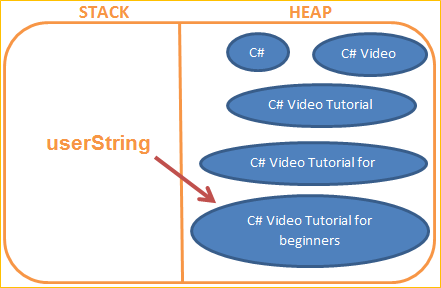 So this process continues until, userString reference variable, points to the last string object (C# Video Tutorial for beginners), leaving the other 4 string onbjects on the heap(orphaned), until they are garbage collected, increasing the pressure on memory. But on the other hand, StringBuilder string objects are mutable, meaning they can be changed inplace, without the need of creating another new StringBuilder object. The above example is rewritten using StringBuilder object. With StringBuilder, no matter how many times you manipulate a string, you will ever have only one instance. So in brief, here are the differences between String and StringBuilderobjects. 1. Objects of type StringBuilder are mutable where as objects of type System.String are immutable. 2. As StringBuilder objects are mutable, they offer better performance than string objects of type System.String. 3. StringBuilder class is present in System.Text namespace where String class is present in System namespace. Just imagine, the number of orphaned string objects that get created on the heap when you have a program as shown below. Because the video was very helpful. I was able to finish the 60 video series without getting bored. Thank you Venkat. You did great job. Thanks a lot for these super .net videos.... May Lord Venkateshwara Bless you..
hi, Due to ur videos last year I got a job in hcl and now iam preparing for capgemini interview ... again referencing ur videos only.. that's the greatness of ur videos.... thanks a lot..